Letters should be 1-2 paged single-spaced in length. Provide the context for your relationship with the candidate and the length of time you have known him/her. Situate the candidate's performance in the larger context of your experience. Address the student's academic performance or extracurricular engagements in detail and with specific examples if possible. A recommendation that demonstrates a personal knowledge of the candidate beyond the grade they may have received in your class delivers a strong and lasting impression. Try, therefore, not to rely solely on a summary of a candidate's performance in a class or a cursory review of their transcript and/or resume. Some scholarships (like the Truman) will ask you to address a very specific quality in a candidate (like leadership, for example). The candidate should be clear about what you are being asked to address and your letter should clearly and specifically address that quality. Be specific about why the student is a strong candidate for a specific fellowship. Avoid hyperbole as well as overly negative language. The foundations that grant these awards are looking for realistic, substantive evaluations of candidates rather than overly positive, unsupported statements. 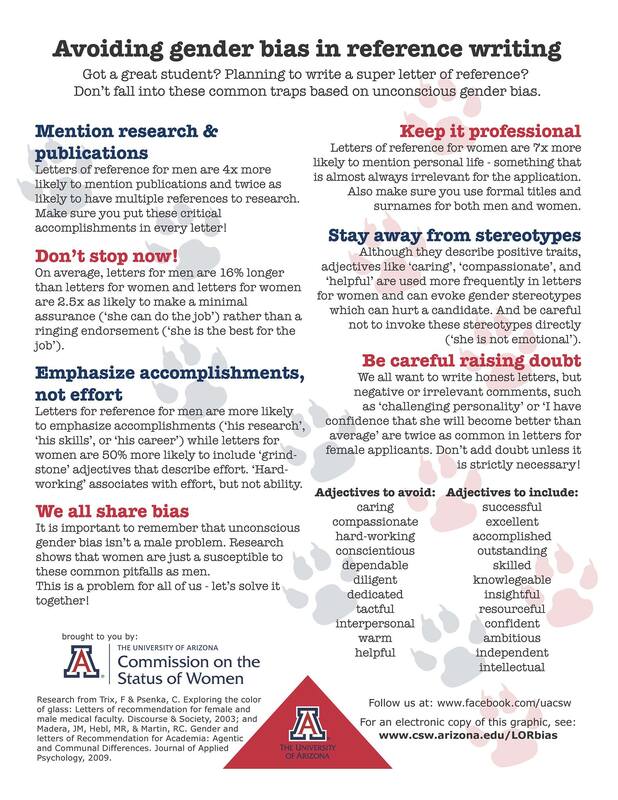 Download a handout on how to avoid gender bias when writing letters of recommendation. Too short, vague, unsupported points. Generic letter or letters that were obviously written for other purposes (grad school admission, for example). Letters that merely summarize a candidate's resume or transcript. Letters that merely describe classes taken or activities rather than the work the candidate did within those contexts. Letters that evaluate the candidate negatively, or even as merely average. *Recommendation letters that come in after the deadline for national fellowships will never be considered as a part of the candidate's application by the foundation, and will therefore greatly disadvantage the candidate. Oxford University Press Blog: How to write a letter of recommendation. Writing Letters of Recommendation, A Faculty Handbook. This online book addresses detail, content, style, sample letters, and guidance specifically for nationally competitive awards.